If you’ve ever wanted to find something on the Internet before, be it a website, picture, video, or something else, chances are that you’ve used a search engine website. You’ve probably used one of the “big three” search engines, those being Google Search , Yahoo Search, or Microsoft’s Bing. What is DuckDuckGo Search Engine? A potential problem with these websites, though, is that they record information about you and how you use them. In some cases, this information is used to sell advertisements, so you’ll see pitches on other websites related to things that you’ve searched for. In other cases, the information is used to “personalize” your results. This means that when you conduct searches in the future, you’ll see more search results that have to do with things that you’ve searched for before, but not necessarily ones that are the most relevant to what you are searching for at the time. Gabriel Weinberg and the people behind DuckDuckGo didn’t like the fact that other search engines were tracking the information of people who used them. They believed that using this information to sell targeted advertisements was privacy-invasive, and that using it to skew what results users would get when they searched was tantamount to censorship. So, they decided to do something about it by making their own search engine, one that would be different. Today, DuckDuckGo is one of the most popular private search engines on the planet. DuckDuckGo is known as a “private” search engine because it doesn’t record any personal Internet-related information about you, unless you explicitly give it to them. This means that it doesn’t care about your computer’s Internet address, your web browser specifications, or even what you searched for, where, and when. With nothing personal to go off of when you search, DuckDuckGo will give you the same results for the same search terms every single time, no matter who you are. DuckDuckGo also has features that block the websites that you find from knowing how you found them, so they can’t use this information to profile you and show you privacy-invasive targeted advertising. All of the basic search engine features you know and love — Search for web pages, images, videos, products, general information, and more on DuckDuckGo. Many results are constructed by DuckDuckGo’s crack tech staff and volunteer groups, and presented first for easy access. Choose how to take back your search privacy — Use DuckDuckGo’s settings to secure your web search. You can use a secure version of the website that makes your activities difficult to track and interpret. You can also redirect your search request so that other websites can’t see your search terms, or even modify your search request so that your search terms aren’t visible to any websites at all, even DuckDuckGo! Zero in on specific websites with “bangs” — DuckDuckGo has a unique feature called “bangs”, which allow you to search within over 6000 individual websites while still using the privacy and security features of DuckDuckGo. Just type in a “bang” followed by your search terms, and you’ll instantly be taken to a search results page for your website of choice! 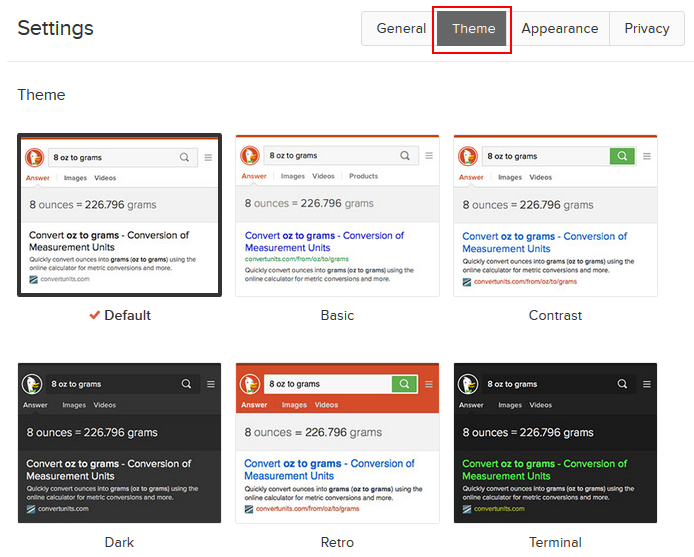 Lots of ways to make DuckDuckGo look good — There are plenty of options for changing how DuckDuckGo appears, from selecting the language and other conventions that it uses to changing the style, size, and/or colour of the text and backgrounds. Or, just pick a preset theme that you like! Now that you’ve gotten your feet wet with a bit of information on what DuckDuckGo is about, we’ll go over the pros and cons of it, including how it stacks up against the world’s leading search engine, Google Search.